Between people there are no borders. ¡Que viva la solidaridad! El Tour Bilingüe No Soy el Army viene a Portland, Oregon!!! Ayudenos a hacer la convocatoria. Veteranos latinos presentan acerca de las múltiples guerras afectando a nuestras familias y a nuestros pueblos: las guerra que se lucha en el extranjero, las guerras que se lucha contra los inmigrantes & la guerra que se lucha contra los pobres al reducirles los servicios públicos. No Soy El Army trae veteranos y jóvenes activistas Latinos para conversar con los miembros de la comunidad sobre las conexiones entre las guerras en Iraq y Afganistán y la guerra contra los inmigrantes aquí en EEUU. 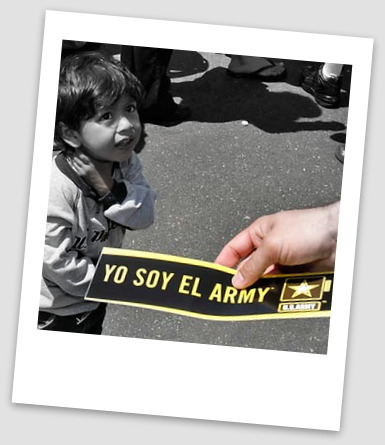 Este Tour esel primero en español en Oregon, que también discutirá específicamente sobre alternativas al reclutamiento militar y sobre otras oportunidades para los jóvenes latinos después de la secundaria. Organizado por:: American Friends Service Committee, VOZ Workers’ Rights Education Project, Portland Central American Solidarity Committee. The biggest free trade agreement since NAFTA in the middle of the worst economic crisis since the Great Depression!!??? President Obama recently announced plans to push the Korea Free trade Agreement immediately after the November elections. This Bush-negotiated pact is the biggest free trade agreement since NAFTA itself. If passed, it will accelerate the offshoring of Oregon jobs, expose the state's environmental laws to new forms of attack and prohibit the type of banking regulations needed to head of the next financial crisis. We also know that if Korea passes, ratification of the US-Colombia FTA will not be far behind it. Senator Wyden chairs the Senate Trade Subcommittee, and is going to play an important role in determining whether or not the Korea deal moves forward. Please call him right now at 503-326-7525 and let him know you want him to oppose the Korea Free Trade Agreement. Write to Senator Wyden and other Members of Congress now using this online action alert. and US takes stand against impunity in Guatemala? The Portland Central America Solidarity Committee educates and mobilizes community members, workers and students around struggles for human rights and social justice throughout the Americas. We meet the 1st and 3rd Wednesday of every month from 7pm to 9pm at our office where we plan and evaluate our work to build cross-border solidarity in the Americas. El Viejo y Jesus- This Friday!